Water in Varanasi is facing in Garrett Hardin’s terms, a “tragedy of the commons”. It suffers from overexploitation and severe pollution. Working with water in four “commons”—clouds, nallahs, kunds and aquifers—we turn Varanasi around beginning with one of its most significant landscapes: the Varuna. Seen as a tributary of the Ganges and made into a drain by the city, we see it as an opportunity to transform the city from a land-based entity to one that organizes around its water commons. Identifying four water commons in Varanasi, looking at them in different time frames; each has its own rhythms and encourages its own means of accessing water. 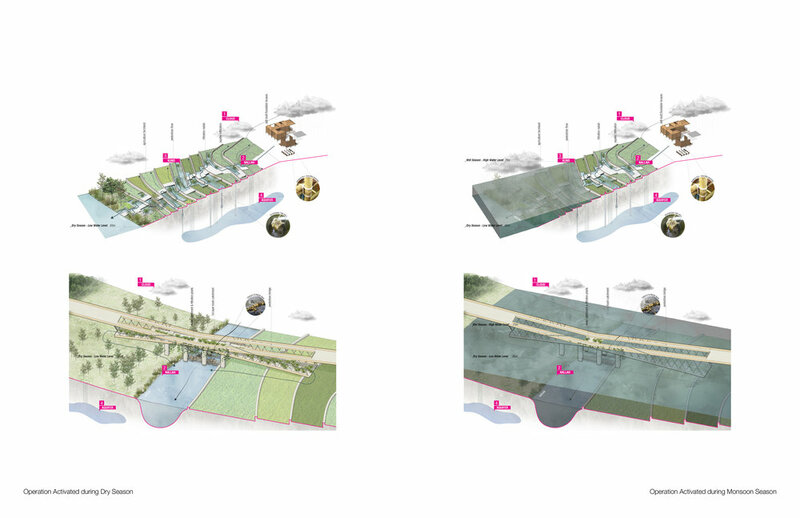 Four Commons explores and enhances the relationship of these four commons, allowing them to operate in a sustainable system, one that takes advantage of fluctuations in rainfall, humidity, water table depths, saturation of soil and flows. It aims to restore the value of Varuna as a spiritual spine and a cleansing biotope.